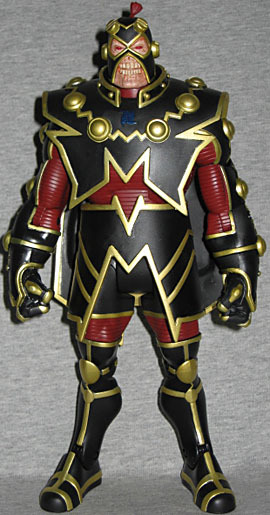 Back when Mattel's DCU line was starting up and we learned that there would be Build-A-Figures included with each series, there was a lot of talk in the fandom about which characters deserved the treatment. One of the names bandied about was Imperiex, and the almost universal reaction was a simple "who?" Imperiex wields the power of the Big Bang itself. Wanting to destroy the present universe and create a new, more perfect universe, Imperiex sets out to destroy the universe world by world. When Imperiex arrives at Earth, the heroes and villains of the world unite as one to fight him off. Superman, with help from many other heroes, manages to send Imperiex Prime's consciousness back 14 billion years. If Thanos is Marvel's rip-off of Darkseid, then Imperiex is DC's rip-off of Galactus. 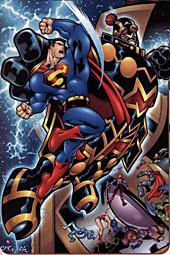 He first appeared in 2000's Superman #153, a comic I apparently bought for no good reason. Mongul came running to Superman for help after Warworld was destroyed, and together they fended off the big new villain. It was then revealed that the thing they fought was merely a probe, sent by the true Imperiex to test Earth's defenses. Imperiex is the BAF for the Wal*Mart-exclusive DCU Series 10, which is at least somewhat appropriate: you put the figure no one cares about in the series no one can get, and then they don't feel bad for missing out on him. The figure comes in six pieces: torso, head, pelvis, arms and legs. There were seven figures in Series 10, but the lame Batman didn't come with a piece, so thankfully you didn't have to buy him to finish the big guy. The pieces fit together tightly, but getting the head in place is a little tricky: if you think you've got it into the neck, but it's still "bobblehead" loose, you need to push it in the rest of the way. Thanks to the strange little topknot, Imperiex reaches 9½" tall, and he has all the articulation you normally expect from Mattel: head, shoulders, biceps, elbows, forearms, chest, waist, hips, thighs, knees and ankles. The size actually works for him, if you consider this to be one of the Imperiex Probes, rather than the guy himself. To give you an idea of how big the real Imperiex is, the Probe that Superman and Mongul fought was smaller than the real version's eye. So look at the eyes on this figure, and imagine that the full-sized version was small enough to stand in front of one of them without blocking the vision. Imperiex's sculpt is really nice, but we'd expect no less from the Four Horsemen. His costume is one of those late-90s/early-00s total messes, designed by Ian Churchill, but more familiarly drawn by Ed McGuinness. Those two guys are at opposite ends of the spectrum, art-wise, and the Horsemen's sculpt very nicely splits the difference between "stupid detailed" and "cartoon simple." The only textured areas are the red ribbed panels on the torso, inner arms and lower thighs, while the rest is smooth. 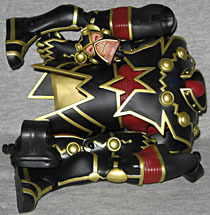 The black areas aren't undetailed though, because every one of those gold elements is a raised part of the sculpt. The face is truly creepy, looking like a desiccated corpse with a thick helmet bolted onto its head. Whatever lips there once were have been worn away, peeled back or devoured, revealing his browning teeth. Apparently Imperiex is a smoker. There is one flaw, though: his skin is fairly pink, when in the comics it was always shown as gray. Additionally, his eyes are red, when they should be purple. Imperiex was the central villain of the "Our Worlds at War" crossover event, which was pretty much forgotten the minute it was over. Its big draw was supposedly the idea that anyone could actually die, but of the handful of characters who actually did, all of them came back to life almost immediately. It's like "OWAW" was swept under the rug as soon as the final issue came out. 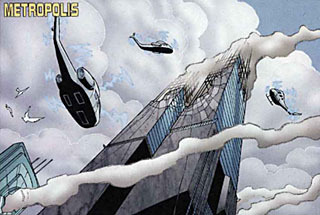 In fact, the thing it became best-known for was inadvertantly publishing an image of the destroyed Lexcorp Towers in an issue that came out on September 12, 2001. Whoops. 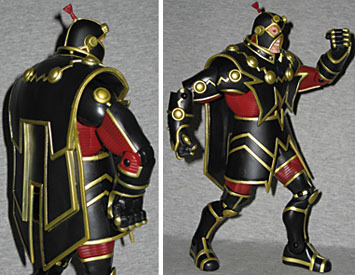 The crossover's forgotten, the villain's forgotten (other than serving as the inspiration for a villain on the Legion of Superheroes cartoon), but by gum, he's got an action figure now! It's probably more than he deserves.